Many people know the name “Nosara,” which is a northern coastal region in Costa Rica famous for surf, yoga, and wilderness beaches. However Nosara actually encompasses several beach towns and a town center. Those in search of the quintessential Nosara, with clean surf breaks that last all day, world class yoga studios, juice bars, and a strong expat community, should head to the beach town of Playa Guiones and nearby Playa Pelada. 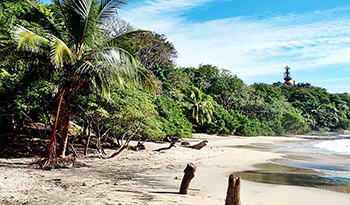 The primary language in Playa Guiones is Spanish, like the rest of Costa Rica, however with such a strong North American influence the neighborhood at times feels more like Southern California than Costa Rica. Thanks to the famous Nosara Yoga Institute in Playa Guiones, this neighborhood has one of the oldest expat communities in all of Costa Rica. English is widely spoken and many Western comforts are available including a classic French bakery, all organic juice bars, a gourmet grocer, and even a mini golf course. Despite this Westernization, Playa Guiones maintains its small town charm. Most developed communities impose an HOA expense. What's this all about? In Costa Rica, it is somewhat common for real estate to be held in a corporation—of which 100% shares are owned by a person—rather than the person owning the property directly. In this case, rather than the parties executing a transfer deed to effectuate the sale of the property, the parties execute a Share Transfer Agreement.